President Abdel Fattah al-Sisi’s administration is responsible for an unprecedented assault on the enjoyment of basic human rights by Egyptian citizens, as arbitrary laws violating the fundamental principles of human rights and civil liberties are developed and enforced in the name of national security. Highly publicized cases such as the farcical Al Jazeera trial and the mass death sentence handed to 683 people are simply the tip of the iceberg, as state-sanctioned assaults on freedom of expression and association become the norm. University campuses have been declared military zones, in which martial law applies: recent attacks by the security forces have seen the arrest of some 200 students, and the death of Omar Sharif, a student in Alexandria, on October 21st. The lack of freedom of expression online has been repeatedly criticized by states at the United Nations. Non-governmental organisations have until November 10th to register as under a highly restrictive 2002 law, or face criminal charges: since al-Sisi’s September modifications to the law, the penalty for organisations receiving foreign funding with the intent to ‘harm the national interest’, a broad and undefined term, is a fine of US$70,000 and life imprisonment. It is clear that the space for free and open discourse is rapidly shrinking. As the voices of Egyptian activists are being silenced, we, as an international community, must make ours heard. 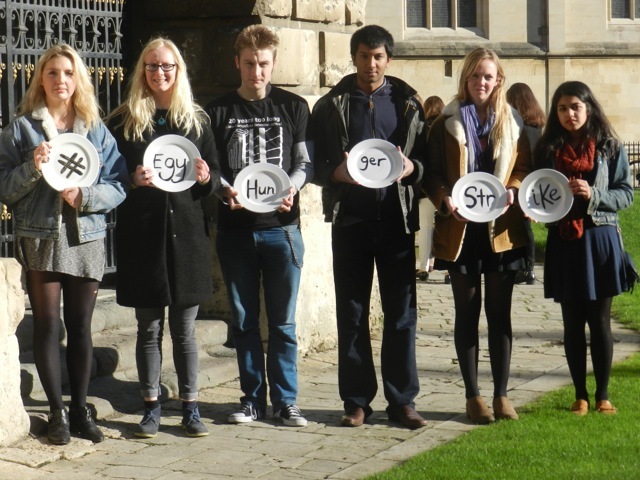 Oxford University students have joined Egypt Solidarity Initiative’s 1000 Hours of Hunger campaign, standing with the 140 political prisoners on strike in Egypt. Our support is needed more than ever: Mohamed Soltan, who has been on strike for over 280 days, has slipped in to a sugar coma and is now in intensive care. The plight of him and many others must not go unnoticed. Over a two week period of rolling strikes, Oxford students are hoping to raise awareness about the reversal of human rights in Egypt, and to contribute to the mounting international pressure to free the arbitrarily detained. Will you join us?